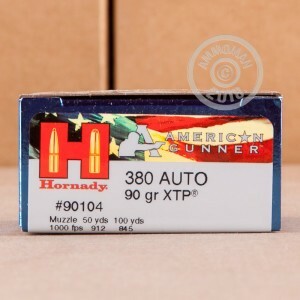 These .380 ACP cartridges belong to Hornady's American Gunner line of self-defense cartridges and are priced to enable you to "shoot what you carry" at the range. 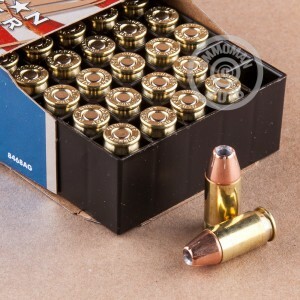 Each round in this box of 25 fires Hornady's tried and true XTP hollow point bullet at 1,000 feet per second out of the muzzle. This unusually high velocity combined with the high-penetration capabilities of the XTP bullet help compensate for the typical shortcomings of the .380 ACP and make it a more reliable defensive cartridge. 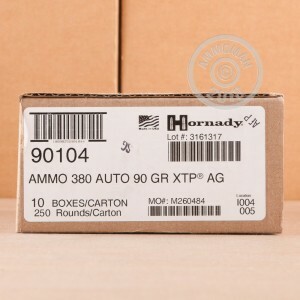 These cartridges are loaded at Hornady's headquarters in Grand Island, Nebraska using non-corrosive Boxer primers and brass cases. Remember to place an order for $99 or more at AmmoMan.com to qualify for FREE shipping!